Bristol-based caravan maker Bailey may have been late to the motorhome party, only launching its first Approach range in 2011, but it has already taken a firm foothold in the UK market. Like its caravans, the firm’s motorhomes major on value for money, with strong kit levels, and the arrival of the Compact range last year made them still more affordable. The three-berth 540 won Best Compact Motorhome in our 2014 Motorhome of the Year awards, so how does its two-berth 520 sibling fare? Unlike the 540, which has a drop-down double in the centre of the ’van, the 520 features a large rear fixed double mounted high above the huge garage, with a front lounge and a mid-mounted washroom and kitchen. It’s an ideal layout if you like to combine comfortable touring with active sports such as mountain-biking. We’ve been lucky enough to run this 520 for nearly a year, giving us plenty of opportunities to discover how it performs in short- and long-term touring. Like the Approach Autograph models, the Compact uses a Peugeot Boxer base vehicle mated to a low-profile Al-Ko AMC chassis – albeit not the ultra-wide-track version used by its big brother. The living quarters are built using the same ‘Alu-Tech’ construction as Bailey’s caravans, with a framework made of extruded, interlocking aluminium sections, to which the laminated sidewalls and roof are bonded and clamped using no external fixings. Those panels feature glassfibre inner and outer skins with a polyurethane skeleton and polystyrene insulation, giving excellent thermal properties and promising good resistance to water ingress. The end result is a pretty good-looking motorhome. The black cab style that Bailey pioneered – and has since been employed by Swift and Marquis for their ‘Black Edition’ models – gives a modern look, aided by the colour-coded front bumper. Although a low-profile, it is still fairly tall and that, combined with a short overall length, means that it can look a little squat. The side decals blur the line where the conversion joins the cab, and there’s a curved rear roof to help the aerodynamics and improve fuel consumption. You soon notice the Bailey Approach Compact 520’s frugality. Driven carefully, it will return impressive fuel economy, with 30mpg in reach; add in the 90-litre fuel tank and you won’t spend too long at the pumps, an important consideration on a lengthy tour. And that’s despite strong performance. The Peugeot Boxer’s 2.2-litre, four-cylinder turbodiesel is noisier than the unit used in its Fiat Ducato twin, but feels more punchy and its 130bhp gives the 520 a useful turn of speed for overtaking slow-moving traffic, or cruising at motorway speeds when you’ll also appreciate its comfortable seats and standard cruise control. The 520 feels wieldy on the road, too. That’s down to the combination of its compact dimensions (it’s narrow for a coachbuilt at 2.35m), fine weight distribution thanks to the careful positioning of the gas locker and underfloor battery, and the inherent stability of the front-wheel-drive chassis. It’s a doddle to drive around town, and fun on a country lane. Push hard and you can feel the weight over the 215/70 R15 front tyres, but you won’t feel short-changed by picking a coachbuilt rather than a panel van – apart from the usual penalty of a bit more noise from behind. The big mirrors help when manoeuvring, but a rear camera would have helped with reversing, because visibility is minimal. It’s one of few factors that count against the Compact being used regularly, much as you might a campervan. We suspect that plenty will still want to use their 520s as an occasional second vehicle, however, at which point the standard pair of belted travel seats will come in handy. While some may lament that the Compact 520 has only two berths, that may be a good thing because the lounge area is perfectly sized for a couple to enjoy. There’s seating for four, and the table – which lives in the garage when not in use – extends to accommodate guests, but four-up this ’van soon begins to feel a touch cramped. For two, however, it’s plenty roomy enough and the standard sunroof makes it feel lovely and bright. That sensation is boosted by the pale, leather-look optional ‘Piccadilly’ trim fitted to our test vehicle. It’s quite jazzy and costs an extra £199; if you don’t fancy the outlay, or find it a bit eye-popping, the standard ‘Trafalgar’ is more traditional and sets off the walnut-effect wallboard just as effectively. They are complemented by the drop-in carpets, which are easily removed for cleaning, but did begin to fray after a year of heavy use. One complaint with the living area is that it is laid out over a number of levels, which makes it harder to navigate and means that those in the two fixed seats find themselves sitting lower than those in the swivelling ‘captain’s chairs’ up front. That said, headroom throughout is good (up to 6'9" in places), there is plenty of ambient and spot lighting, and there’s a good smattering of 230V sockets. However, telly addicts may complain that there is no obvious position for a TV in the lounge area, unless you add a bracket and socket to the washroom wall. 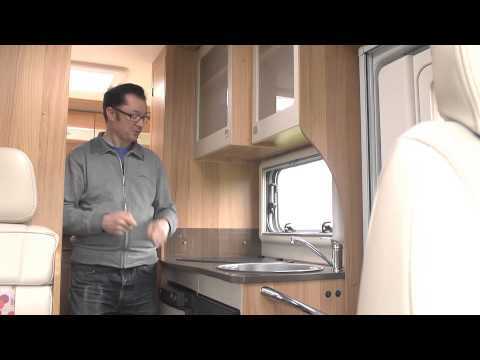 There is no getting away from the fact that the corridor kitchen in this Bailey Approach Compact 520 is not enormous, but then this is not a huge motorhome and you’ll soon find that all of the essentials are there. The gloss-finish worktop space is at a premium, but if you extend the lounge table it’s close enough to use for food preparation, or alternatively you can close the flush-fitting glass hob lid and work there instead. We like the circular stainless-steel sink, which gives a classy look and comes with mixer tap, plus washing up bowl, drainer and chopping board as standard. Pale-finish overhead lockers with translucent centre panels provide a pleasant contrast to the wood effect elsewhere. They also offer plenty of room for groceries and crockery, while a decent-sized drawer and drop-down locker beneath the combined oven and grill will house pans and baking trays. The 80-litre Dometic fridge should be big enough for couples on shorter tours, and can be boosted to 85 litres if you remove the freezer compartment – though access is tight. As well as that oven/grill there’s a three-burner Thetford gas hob, but you won’t find a microwave on board unless it is specified as an optional extra, with Bailey instead preferring to conserve storage space. As long as you don’t suffer from any mobility issues, it’s hard to find fault with the 520’s enormous double bed. If you do, however, the neatly stowed ladder and the slightly narrow entry to the sleeping area may prove a little awkward. If you’re prone to needing the loo in the night, make sure you take the side nearest the exit to avoid having to clamber over your sleeping partner. Once you’re up there, however, it’s extremely comfortable, with a sprung base beneath the foam-filled two-piece mattress that measures a whopping 2.02m x 1.37m (6’6” x 4’5”). At the foot of the bed there is a fully adjustable television mount, with aerial and 230V sockets, and at the head of the bed are reading lights. There’s a small bookshelf on the rear wall, too. Plus, of course, unlike two-berth 'vans that use the front lounge to make up the bed – and the majority of panel van conversions – the bed in the 520 is fixed, so you can leave it made up throughout your trip. In a small motorhome, that is a real luxury. In contrast to the kitchen, the washroom opposite is reasonably roomy for such a small ’van. There’s a proper radiator in here, a roof vent, a mirror and a couple of towel hooks, plus good kneeroom around the Thetford electric-flush cassette toilet. The sink is a fair size as well, with a useful shampoo shelf beneath. The washroom’s offside position also means that you won’t have to remove the cassette through the awning to empty it. Although it’s really more of a wetroom than a proper bathroom with a separate shower cubicle, it is fully lined for practicality and the addition of a shower curtain does at least give a sense of privacy. It also prevents the rest of the washroom from being soaked when you have a wash. The Ecocamel shower head will make the most of the 90-litre on-board water tank, and you can hook up a separate Aquaroll if you need more capacity – though beware because the waste-water tank is 90 litres, too! You’ll do well to run out of storage space in this ’van. The colossal rear garage can be accessed from both sides, as well as from inside the living area, and it features additional cubbyholes and adjustable tie-down points for large loads. Inside, there are two-tone aircraft-style lockers in the lounge and bedroom, but there are plenty more options throughout the ’van. Opposite the washroom is a good-sized hanging wardrobe, while a small door behind the bed ladder reveals further shelf space. Elsewhere, there are more cubbyholes above the cab, and when you run out of space for groceries in the kitchen, you can stow cans and bottles under the rear travelling seats. There’s no doubting the headline in the spec list: the Alde Hydronic Compact 3010 programmable ‘wet’ heating system. It looks after water heating as well, and is easy to control via a touch-screen panel that sits alongside the simple and intuitive main controls. It’s a feature that few ’vans of this size can boast, and adds to the sense of luxury. It would take a very picky buyer to accuse the Compact of lacking equipment, but there are a few absentees that seem slightly odd bearing in mind how comprehensive the rest of the spec is. We’d have liked to see a pop-up worktop extension for the kitchen, and a rear camera would be a great addition – though the ’van is pre-wired for this feature. The only other unexpected omission is the microwave, which we only mention because the kit list is otherwise so generous – like Bailey, we’d probably prefer to stick with the extra storage space. The Bailey Approach Compact 520 has an awful lot going for it as a comfortable ’van for two to go touring. If we had any major complaint, however, it’s with the targeting of this model: the huge garage, the high-sited bed and the vast payload suggest a vehicle aimed at active younger buyers who are into windsurfing, mountain-biking and the like, yet the price-tag and the luxurious spec pitch it into a market usually occupied by retired couples. Bailey has clearly spotted that disconnect, too, because for 2015 the Compact has been discontinued, with this layout slated to reappear in more affordable form in the Advance series.